British rock meets Frank Zappa and Weird Al Yankovic on Broadway. 5. Don't Wanna Be Edward D.
"That's CRAZY Talk!"" is a killer disc with eclectic songs that range in styles from The Who, Dream Theater, XTC and Weird Al to The Beatles and Pink Floyd (with Frank Zappa thrown in for fun) Anyway, this time around, the band has been augmented by more great musicians, including; Roger Johnson and Jimi Powers (lead acoustic and electric guitars), Tony Severino and Jeff Leece (bass) Phil Janzen (drums), Mindy Nilson, Evan O'Hare, Tom Bolenbach and Jason Stone (backing vocals) Chris Fiscus (percussion)and Bill (everything else - what a guy!) And last but not least, Mike Bolenbach continues to perform his engineering magic...cuz he's The Magic Man. Is the world ready for this stuff played live? I dunno...but enough of my yakkin'...let's boogie! "Rockin tune about a craziness that every married man understands. Vocals are creative and the song entertaining. What a great CD! Everything (vocals/instrumentals) on this CD is awesome. I would highly recommend this CD to everyone (all genres of music preference) because somehow, Mr. Slater has incorporated a 'one size fits all' style, so everyone can appreciate it. Enjoy!!! "THAT'S CRAZY TALK" is the latest offering from BILL SLATER - a singer/songwriter hailing from Phoenix Arizona. Bill has come up with an album of strong lyric-based songs awash with wonderful imagery reflecting his very interesting world and drawing upon his life experiences. He transports us to a world of love-gone-wrong, shifty little personalities, would-be superheroes and the fragility of life in general. Bill definitely delivers his own slant of music and humor to a variety of topics. I particularly enjoyed the Scarecrow's perspective in "Scarecrow's Story"; the "Ode to Mary Ann" - a sordid tale from Gilligan's Island; and the song for every guy - "Crazy Island". 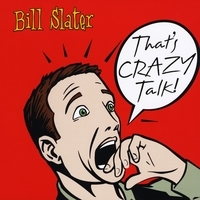 If comedy and music is your thing - then Bill Slater's "Crazy Talk" may be just what you are needing to listen to! Give it a try! Even Clark Kent and Gilligan have scars. Comic Panel 1, Two Frames: Frame 1: Bright Explosion, Voice Balloon lower right--"OOOH, That Hurts!" Frame 2: Imposing Gray Wall, vulture perched on top; Inscription--"Grim Reality"; character on knees and hands to nose, stars above head; Inscription--"Youthful Optimism". Optimism v.s. Reality=Mid-Life Pessimism. If we have lived long enough, we have encountered the wall and have the scars to prove it. That is why Bill's latest collection, CRAZY TALK, is universally appealing. Better yet, Bill treats the subject with a wink, a wry smile, and an upbeat tempo. This old teacher continues to be amazed at the creativity and talent of his former students. Two thumbs up! Bill has done an excellent job with this new project. All of the songs are well crafted lyrically and instrumentally. There's a little something for everyone in this album from lighthearted fun, to more introspective topics. My personal favorites include "Don't Wanna Be Edward D." and "Dreamland's Burning". This album will definitely stay in my standard music rotation. If you like well written songs, seasoned musicianship, excellent production, superb performance, deep content and wacky subject matter, then "That's Crazy Talk" is for you. The CD begins powerfully with "Superhero" and doesn't let you down throughout. "Ode to Mary Ann" will make you rethink the innocence of Gilligan's Island. Existentialistic "Pennies Falling Down a Well" helps put life into perspective. "Dreamland's Burning" is the perfect end's end. Bill Slater tops his last album. "That's Crazy Talk" lives in my ipod. Kudos to ya' Bill. "That's Crazy Talk" is crazy good and fun! This new CD created by Bill Slater is loaded with creative, whimsical and thought-provoking tracks. It will bring a smile to your face while you're tapping your feet! I would also say that this is definitely Bill's best-produced CD yet - it's a tight and terrific production. All the songs are fun - my personal favorites are "Nobody Loves El Chubacabra" and "Second Man on the Moon." Give it a listen - it will brighten your day and your ipod mix. Keep up the good work, Bill! What a great CD! I loved the Crazyness of the lyrics and the music and backup singers were fantastic! It not only was fun to listen to... but I am sure it had to be fun to make! Great job to all involved!!! Thanks for sharing! You hit this one!